2. “What was the result of the siege? Verse 2. 3. What command did the king give? Verse 3. 4. What qualifications were required Verse 4. 5. What were they to be taught? 6. What was the king’s appointment in regard to their food? Verse -5. 7. How long was their course of training to continue? For what purpose was this training? 8. Who were among the young men selected? Verse 6. 9. What names were given to them? Verse 7. 11. What request did he make? 18. What reply did he make to Daniel’s request? Verse 10. 15. How was this proposition regarded by Melzar? Verse 14. 17. What did God give to these children? Verse 17. 18. What special gift was bestowed upon Daniel? 20. How did they compare with the rest that were examined? Verses 19, 20. 1. Nebuchadnezzar, king of Babylon, besieged Jerusalem B. c.. 607, and captured it B. c. 606. In. B. c. 588 he took it again and destroyed the temple, and laid the city waste. 2. DANIEL’S purpose to not defile himself with the king’s meat (food) and the wine which he drank presents a very worthy example of temperance and self-control. How many of God’s professed people will partake of unhealthful foods and drinks to please their friends, or gratify their own tastes, instead of having a fixed purpose, as did Daniel, to glorify God! Daniel would please God by not defiling himself, even though lie displeased the king and lost his life. He preferred to honor the God of heaven, though lie disobeyed the mightiest monarch on earth. This is loyalty to God. 3. THOSE who are loyal to God and faithful in their work, and consistent in their course toward others, will find friends even in kings’ courts, or wherever God’s providence places thorn. 4. “KING’S MEAT” (PULSE).—The “king’s meat,” or food, would no doubt include many unhealthful articles and* unclean flesh moats, and very likely some things that were offered to idols; hence loyalty to God would lead Daniel to refuse such food, and choose simply “pulse to eat and water to drink.” The literal meaning of the words here translated “pulse,” according to ” Smith’s Bible Dictionary,” is seeds of any kind. It further says: ” Probably the term denotes uncooked grain of any kind, whether barley, wheat, millet, vetches,” etc. 5. 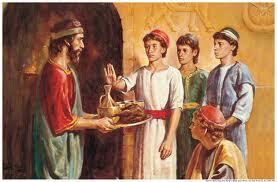 THE better appearance of Daniel and his companions was probably not wholly due to the better food which they ate. It is evident that God’s special blessing was given them because of their devotion and loyalty to God. 6. To stand before the king was to occupy a position of honor and authority in the king’s court. 7. WE are not to infer by the expression in verse 21 that Daniel died in the first year of King Cyrus, but he continued in the king’s court as long as the Babylonian Kingdom ruled, even until it was overthrown by the Medes and Persians. See chapter 5.